Grow your brand with better packaging. Our custom printed boxes will protect your products, showcase your brand and create a superior user experience every time. First impressions are important, and custom printed boxes set your products apart at first glance. At Suncoast Identification Solutions, we create custom packaging that’s tailored to your brand and the size of each product. Don’t send plain brown boxes to your customers’ doors. Custom product packaging puts your company’s professionalism on display and shows your customers that you care about every detail of their experience with your brand and products. Whether you’re in need of a single prototype box or an order of 10,000, we’re ready to help you create custom product boxes that you and your customers will love. 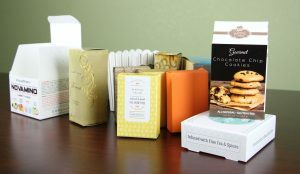 A window product box is a great way to display your product within its packaging. These boxes can be stacked for display and also stored very easily. Our hanging boxes come in a range of sizes that allow room for all types of products. These boxes work well lined up on a display rack. You won’t need to rely on photography with these boxes. They give the customer an actual look at the product, while its hanging on the shelf. This box offers the same product visibility as the standard window box, but includes a protective sleeve. The sleeve also offers more room for product messaging and photography. Take your products to the next level by branding their actual shipping container. These boxes come in numerous sizes and are equally durable and beautiful. 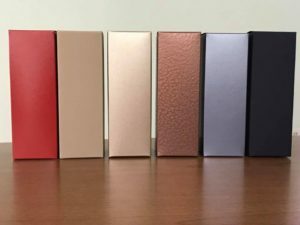 Flap cover boxes offer a unique presentation for your product. They are easy to open or can be used as a display box for a group of small individually packages items. This box serves two purposes. It offers a safe shipping option for your product and also works as a container to display your products within a retail environment. This box is guaranteed to get your product noticed with a space for point-of-purchase signage in direct correlation with the product itself. These boxes are best used in prominent locations. Carton shipping boxes are crucial in delivering multiple products safely to the consumer. 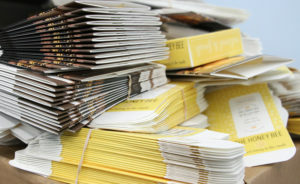 Customizing these with your logo or information adds credibility to your company. At Suncoast Identification Solutions, we offer custom product boxes in a variety of textures, colors, materials and templates that provide an unlimited number of style combinations. These are the design elements that make your product boxes unique and unforgettable. Our product box packaging is made from top-quality materials, so when your package arrives at a retailer or customer’s door, they know your company is serious about customer satisfaction and quality from start to finish. Interested in experiencing our quality materials, textures and other features before placing an order? Request a sample and discover the Suncoast Identification Solutions difference. The bells and whistles are what make your products stand apart from the rest, and they all begin with packaging. Our finishing options are what allow you to brand your boxes, add technical details, promote the benefits of your product and differentiate your item from the competition. Our finishing options give our standard boxes a custom look and can further enhance the appearance of your product’s unique design. UV coating, embossing and foil stamping are just a few finishing options that will enhance the customer experience and reinforce your product’s individuality. Reach out to us to learn more about our finishing options. At Suncoast Identification Solutions, we’re determined to exceed your expectations from start to finish. We know it’s important for you to know exactly how your finished product packaging boxes will look, so we don’t expect you to make any purchases until you’re satisfied. That’s why we offer 3D proofs that accurately display all sides and angles of your custom packaging, including your artwork or custom designs created by our expert graphic designers. We specialize in jobs of smaller quantities, which means you enjoy a one-on-one customer experience that can’t be found with other companies. It’s time for you to make a statement — and increase sales — with custom product packaging. Complete the form below to request a quote and get started today.